Leonardo da Vinci’s Last Supper may have been the High-water mark of Italian Renaissance. It may beguiled art historians and philistines alike with its bold play of perspective and scale. And it may ingeniously convey a complex story in a single image. But haven’t you always though it had something missing? Thankfully Marco Pece- a-54-year old artist from Turin- has provided it. His Lego homage to The Last Supper gives the crumbling 15th-century mural in the refectory of Milan’s Santa Maria delle Grazie fresh meaning. The characters in this biblical image become, in every sense, three-dimensional. Anc through the disciples visible joins-stick-on hair- dos and costume beards – we are made aware of their frailty. Leonardo is not the only artist made to look lumpen by Pece. 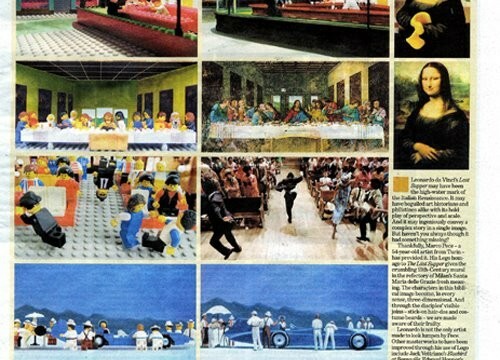 Other masterworks to have been improved through his use of Lego include Jack Vettriano’s Bluebird at Bonneville, Edward Hopper’s Nighthawks, and another Leonardo: Mona Lisa. Pece also recreates well-know film moments – the chapel scenes in The Blues Brothers and The Graduate. Lego has been available as an artistic tool since 1949, when the Danish company started manufacturing ”automatic binding bricks”. But this came too late for Leonardo. It came too late for Hopper, too, who painted Nighthawks in 1942. But Vettriano, a child in the early days of Lego, ought to hang his head.